The Stockholm Resilience Centre has produced a new study of the planetary boundaries, a concept it first unleashed on the planet in 2009. It reveals a worsening situation. It has received considerable media attention as an issue of environmental impact. But it is much more than that. 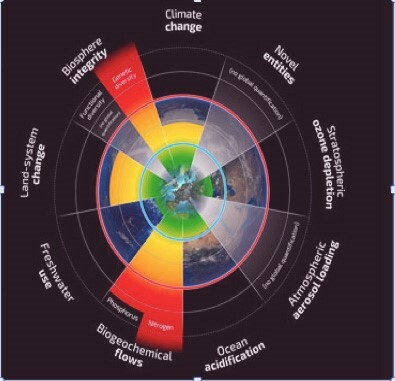 The idea of the planetary boundaries, of which the Stockholm Centre identifies nine, is that these are the boundaries of a sustainable world. Staying within them makes the world liveable. In 2009, a large team of scientific authors concluded humanity had breached three of them. The new study says we have broken through four. The last two have not yet been quantified so we don’t know how we’re doing. In this illustrative representation of the concept and the analysis (and, not to boast, but there is a better one in my The State of the World Atlas, based on the 2009 study), the blue ring illustrates the planetary boundary. From there out to the red ring is what the study’s authors call the zone of uncertainty. Beyond the zone of uncertainty is certain danger. We are in that extreme zone, the study says, on biogeochemical flows and the integrity of the biosphere; we are in the zone of uncertainty with climate change and land system change. The world we have known till now – indeed, the one we have known for the 11,700 years of the Holocene epoch – is the one inside the blue ring and in the safe zone. As we start to transgress the boundaries of sustainability, we get into unknown territory. We don’t know what it’s like out there on the other side of the planetary boundaries. And in particular, we don’t know what happens if we cross all those frontiers. Last year, writing about what I have called the ‘conflict horizon’, I identified long-term pressures on the planet’s habitability as one of the underlying factors increasing conflict risk over the coming two decades. The most commonly (and rightly) cited environmental pressure is climate change but the interplay with the other environmental pressures is also important and potentially destabilising. In the context of conflict risk, what matters with climate change and the other pressures on the boundaries of sustainability is not the source or the form of the pressure alone but the response we manage to mobilise. The challenge from nature, which is resulting from the pressure humanity has put upon it, is a challenge for how we organise ourselves and run things. In more formal language, it is a challenge for governance and for our social, economic and political institutions. As the basic conditions of life become more difficult, the risk of countries will be highest in those countries where inequality is sharpest and conflict management institutions are weakest. Pressure on the boundaries of sustainability is increasing the risk. We have to ease the pressure. We have to adapt to the consequences we cannot avoid. We will find both more straightforward if we also find ways ease the other factors increasing conflict risk. There has also been considerable press coverage recently of a new Oxfam report about inequality forecasting that by next year one per cent of the world’s population will own half the world’s wealth. Everybody seems to be getting the message about inequality these days; even the head of the IMF has said it threatens democracy and hampers economic growth. The environment is not just an environmental issue. Conflict is not just a peace issue. Building resilience means addressing human impact on the environment, of course, and more besides. It sounds a daunting challenge but the good news is that you can look at it the other way round. Building resilience, building peace and meeting the governance challenge are essentially the same activity. This entry was posted in Conflict & peace, Resilience, The State of the World and tagged biosphere loss, Climate change, environment, human security, inequality, peacebuilding, planetary boundaries, Stockholm Resilience Centre. Bookmark the permalink. Some say we have to continue on a growth line indefinitely, they would be the banks and anyone associated with inflationary pressure as a sign of a healthy market which in turn provides profit. I tend to disagree with this approach as i know we cannot continue infinitely in a finite world. Some say the planet is by no means at population capacity. Maybe not, but considering the impact of the current population we must find a way of curtailing our impact. More people on the current trajectory will be suicidal. Suicidal to whom? All of us. Why? More of everything including degradation. Quantitative easing is being applied to the markets in Europe as was done in the US. but this measure is a fools game. By devaluing currencies, we are in effect devaluing our future prosperity. This scheme does not create wealth it only serves to liquefy growth. And liquefying growth makes us all that much poorer. Think of it as full circle capitalism. The richest are still the richest but the middle and lower incomes will take a hit. In effect, consumerism as we know it is flat and will remain so for quite some time. Local inequality is far different from global inequality. Local inequality is gauged by a perception of value for goods and services. Global inequality is the third world being locked out of the market unless there are mechanisms to exploit natural resources and/or low wage labour. These people have no hope of equality with the likes of the west. This brings us back to Quantitative easing. It makes us all a little less equal in the west when compared with the wealthiest, which in turn doesn’t provide wealth to the third world. Consumerism turns the wheels of profit, it lays waste to the land through corporations and governments who are by no means the protectors of the universe. How do we get government and global business off this path of destruction? It may be happening already, low growth and low consumerism. Greece has been an example of not only fiscal irresponsibility but of what happens when there is nothing to capitalise on. Am i saying that low consumerism is a way forward? No. I am pointing out the trials and tribulations of the evidence at hand. Capitalism needs to turn a profit from something that is cheap or free and easily accessible. Maybe a re-evaluation of what it is we are striving for is in need. Maybe it is time to get creative and invent new non toxic industry. The profitability would be based on value to our mutual well being. But who the hell wants that?